also scientifically known as "Thymallus Brevirostris Kessler" is basically just another class of the commen grayling, inhabiting vast river systems and lakes in the Altai Mountains of North-Western Mongolia. This astounding fish is an endemic form, which lives only here in land-locked rivers flowing into large lakes, instead of having their mouth at the open sea. Missing a large predator and competing fish like a Taimen-Huchen or a sea-run Salmon, this Mongolian Grayling has developed a large growing breed, which turned into an aggressive predator at the top of the food chain. 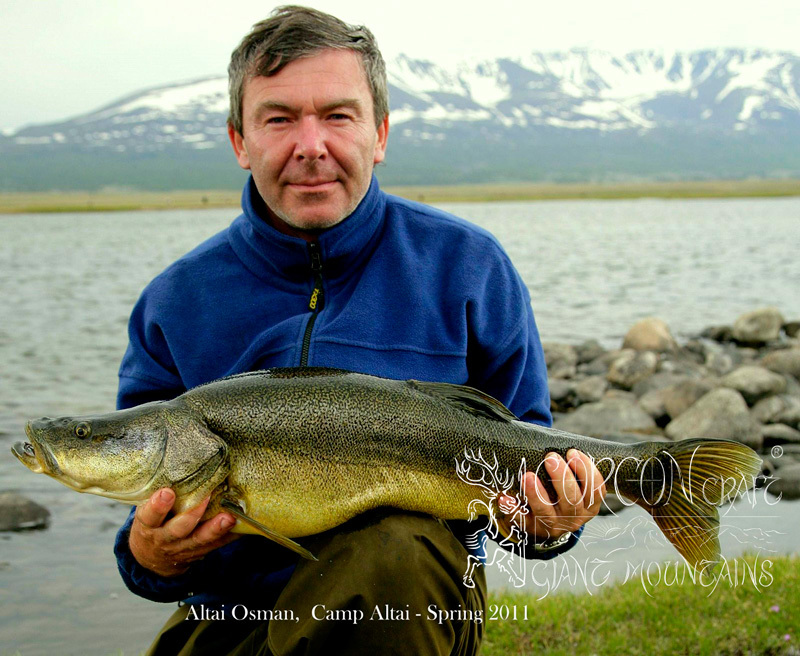 have been caught by us and our clients during the past few years at our Fishing Camp in the Altai Mountains. The largest specimen caught so far, are up to 75 cm / 30" by spin-fishing with lure or spoon, and up to 68 cm / 27" by fly-fishing with nymphs or streamers. But we have seen much larger grayling of at least 85 cm caught in a traditional way by local nomads and native fishermen. Their tales speak of authentic specimen of around 100 cm / 40" in the deep mountain lakes. We see no reason to doubt these judgments and we seriously feel, that there is a great potential for our sportsmen-clients, willing to work with us on these exciting fish and further record class catches. is truly plentiful and great sport at our well-established and fixed wilderness camps. While our solid yurta/ger-camp in the remote Altai Mountains is rather new and running just a few seasons now, until we had explored and finally found a good strategic place for our base camp. We were hiking, horse-trekking and fishing extensively ourselves to find out, where and when to ambush these large grayling. Our own experiences were leading to the clear conclusion, that the very opening of the fishing season, when these fantastic fish enter some of the fast-flowing rivers for spawning, offer the best possible chances for the adventurous fisherman. Therefore, our Altai Camp is running only for 2 weeks each season of sport fishing at the various rivers in June. 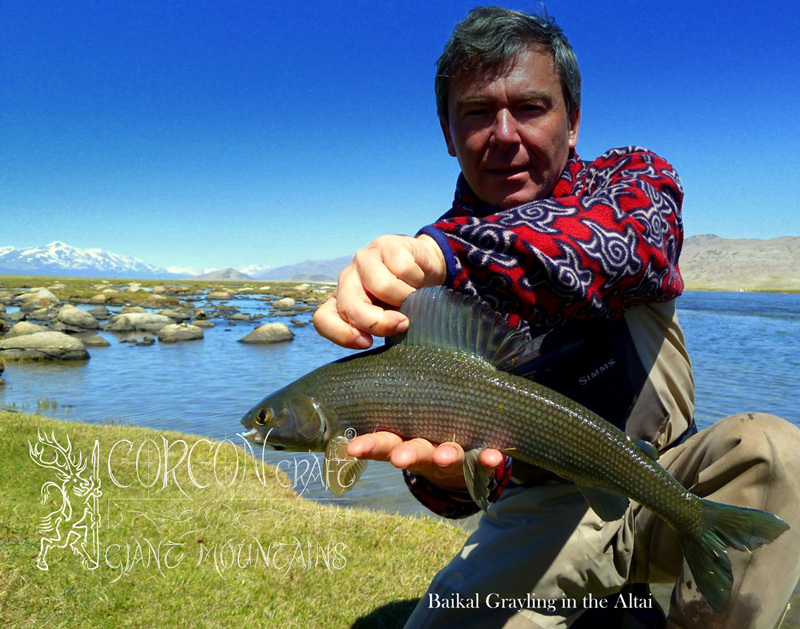 While these grayling remain practically unfishable in a sporting and enjoyable way, when they return into their large and very deep mountain lakes. are offering a colorful mixed bag for the passionate fly fisherman, who has specialized in sophisticated grayling fishing. 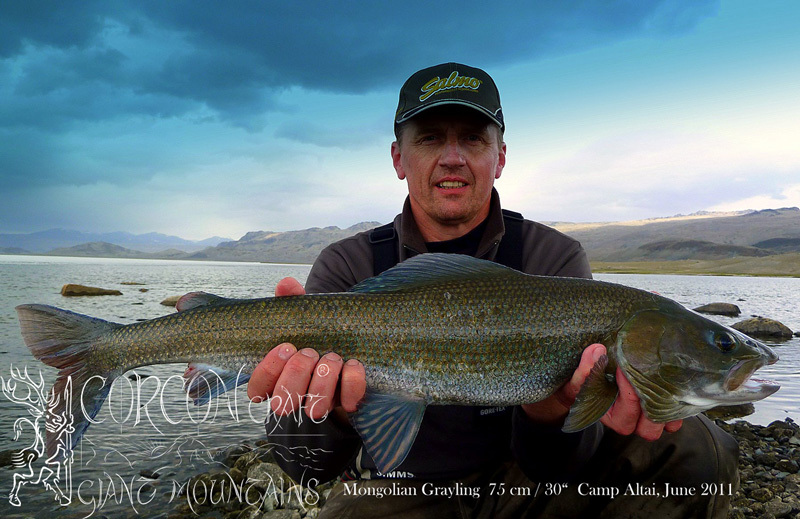 Besides this rare opportunity for the great Mongolian Grayling, we are fishing quite commonly for the more abundant and elegant Baikal Grayling of up to 60 cm / 24" with the Czech Nymph method and for the most beautiful Yellow Tail Grayling with dry flies at our comfortable log-cabin camps and legendary rivers throughout the Northern Provinces. 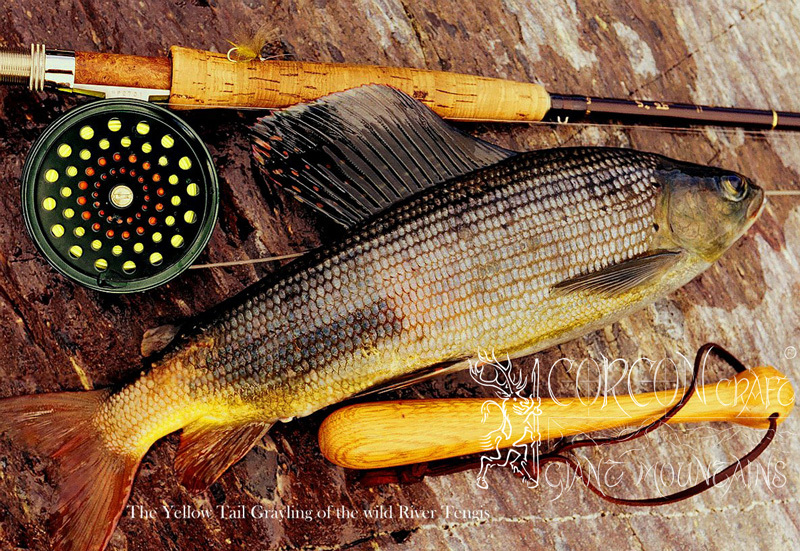 A seasoned fly fisherman can exceed a daily score of 50 grayling easily, with an average size of 45 - 50 cm and a few specimen being much larger. is another notable fish of the waters in the Altai Mountains, offering great sport as an endemic form living only here in these truly breathtaking remote rivers and lakes. Scientifically classified as "Oreoleuciscus Potanini Kessler" this is the predator form of a big and heavy fish, growing up to 115 cm in length and 15 kg / 35 pounds in weight. We have caught specimen of up to 92 cm and 10 kg ourselves so far. These strong fish are of a very distinct and prehistoric character, they occur abundant at the same waters as the great Mongolian Grayling, and they are tremendous sport on lighter tackle. - A stout 9 ½ or 10'ft. # 7-weight fly rod is a very good choice for this kind of fishing, while a long 11'ft. 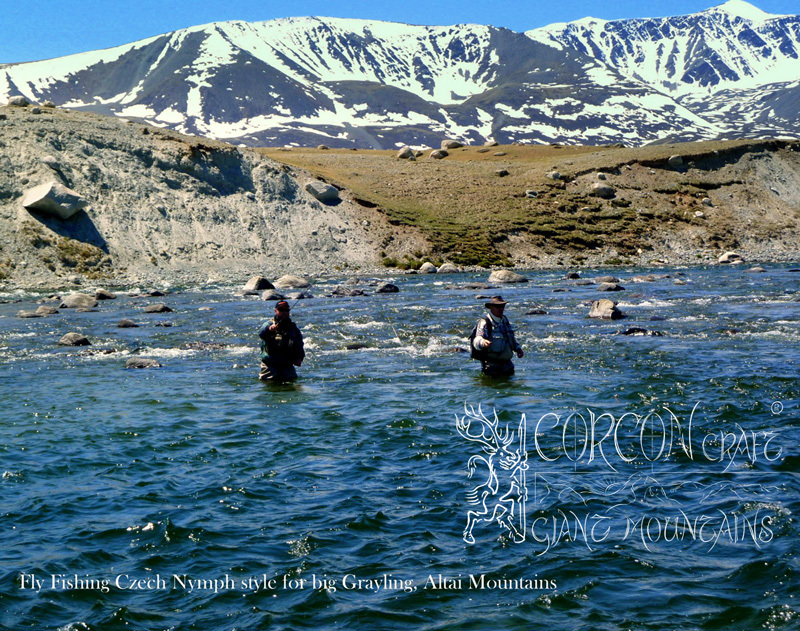 # 7/8 single-hander is the real all-round work horse for fly fishing in the Altai Mountains of wild Mongolia.